There are occasions in everyones lives where you are forced to take difficult decisions, knowing that either choice maybe wrong and will leave a scar; neither choice is suitable. We have been forced to make heart breaking decisions about Arjun’s care from Do Not Resuscitate Orders to Limitation of Treatment Agreements, why ? Largely to prevent there being difficult decisions being made when we are at our most vulnerable, emotionally aggrieved and mentally exhausted. The last 8 days have been terrifyingly heartbreaking. I have watched Arjun writhing in extreme pain and my girls crying with fear of not understanding what is happening to their brother. 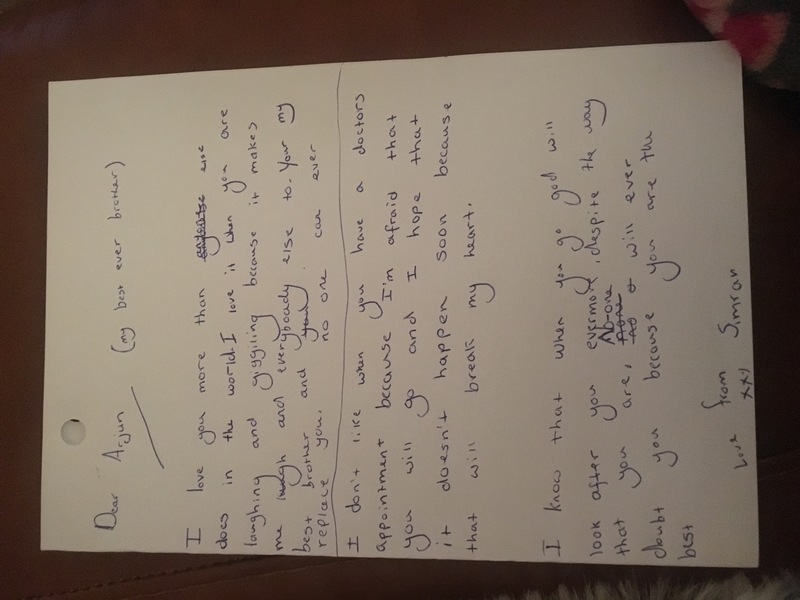 However,It was not until I was looking through the girls writing pads that I stumbled across this to truly understand what they had been feeling; a letter to their brother. Bringing Arjun home was so frightening. We were allowed to take hime home on a ‘phased’ return. This is when you bring your baby home for SCBU intermittently so that you and baby can acclimatise to being home especially of your baby is on oxygen, tube fed or has had come other medical concerns. Here are some basics I found useful when I was suffering from my depression. I know I wrote about it in my last blog post, but here I wanted to share with some of the things I tried. For me it was all about trial and error, but the most useful for me was learning to be kind to myself. Learning and understanding that I AM allowed to feel low and depressed but I HAVE to put a time limit it and try and move forward. I have to deafen myself to my negative and self deprecating thoughts, my negative voice needs to be shut down before it takes hold of me. I am not going to pretend it is easy, because it isn’t; believe me over a decade later I am still in recovery. 1. Be kind to yourself. There is nothing wrong with feeling low. Nothing can prepare you for the shock of a newborn, no matter much you love him/her. Allow yourself to have these feelings and don’t beat yourself up about how you feel. 2. Physical Exercise Even if all this means is taking yourself out into the garden and walking around in the sunlight, alone or with your newborn. You can start with a slow stop and build up to a faster pace. However, just a little fresh air can get the endorphins flowing, but just try to exercise in daylight because the VIT D sunlight will help too. Also, alongside lifting your mood, regular exercise offers other health benefits, such as lowering blood pressure, protecting against heart disease, cancer and boosting self-esteem. 3. Social Support When you’re depressed, the tendency is to withdraw and isolate. Even reaching out to close family members and friends can be tough. Compound that with the feelings of shame and the guilt you may feel at neglecting your relationships.But social support is absolutely essential to depression recovery. Staying connected to other people and the outside world will make a world of difference in your mood and outlook. And if you don’t feel that you have anyone to turn to, it’s never too late to build new friendships and improve your support network. 4. Time Heals Accept that your current mental state and that it is not entirely balanced. In the depths of depression, we tend to see the negatives in everything and find it harder to be balanced about what is going on. You must take the time to gently remind yourself that you are tuned into the ‘negativity channel’ and don’t listen to your thinking. It is definitely distorted when you are depressed. This idea alone can provide some comfort when the world appears bleak. It won’t last forever. 5. Challenge negative thinking Do you feel like you’re powerless or weak? That bad things happen and there’s not much you can do about it? That your situation is hopeless? Depression puts a negative spin on everything, including the way you see yourself and your expectations for the future. When these types of thoughts overwhelm you, it’s important to remind yourself that this is the depression talking. These irrational, pessimistic attitudes—known as cognitive distortions—aren’t realistic. When you really examine them they don’t hold up. But even so, they can be tough to give up. Just telling yourself to “think positive” won’t cut it. Often, they’re part of a lifelong pattern of thinking that’s become so automatic you’re not even completely aware of it. The mental filter – Ignoring positive events and focusing on the negative. Noticing the one thing that went wrong, rather than all the things that went right. ‘Shoulds’ and ‘should-nots’ – Holding yourself to a strict list of what you should and shouldn’t do, and beating yourself up if you don’t live up to your rules. 6. Seek Professional Help. If you’ve taken self-help steps and made positive lifestyle changes and still find your depression getting worse, seek professional help. Needing additional help doesn’t mean you’re weak. Sometimes the negative thinking in depression can make you feel like you’re a lost cause, but depression can be treated and you can feel better!